The first ever winner of the European Footballer of the Year (Ballon d’Or) and the Football Writers’ Association Footballer of the year awards Stanley Matthews is regarded as one of the wonders of the game of football. In a career spanning 35 years, Stanley Matthews put in close to 700 league appearances for Stoke City and Blackpool. 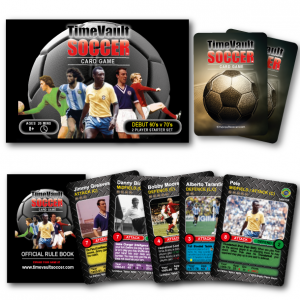 The first pro footballer to be knighted he, played top flight football until the age of 50. A slim, almost frail-looking man Sir Stan had the grace and balance of a cat and a turn of acceleration over 25 yards that none could match. Intelligent, with great close control and mesmerising dribbling ability he earned the nicknames “The Magician” and “The Wizard of Dribble”. 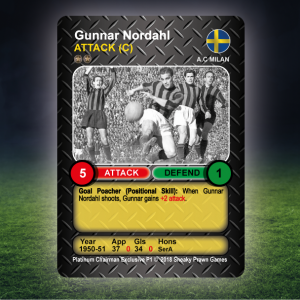 Although suspect defensively, he was critically acclaimed for his exemplary passing, seldom giving the ball away and sacrificing his own goal scoring for creating opportunities for others. His sportsmanship was legendary and having never been booked in his career was referred to as the “the first gentleman of soccer”. Stanley Matthews was held in such high regard it was said that his presence in a team would add 10,000 to away gates. In two spells at Stoke he helped his team to two Second Division titles in 1932 -33 and then again, thirty years later, in 1962 -63. In between he was on the losing side in two FA Cup finals with Blackpool before going on to lift the cup in 1953 in, what was called the “Matthews Final”. Bolton were leading 3-1 with barely 35 minutes to go when Matthews “had the game of his life” in “the greatest ever FA Cup final”, igniting his team and leading them to a last gasp 4 – 3 victory. 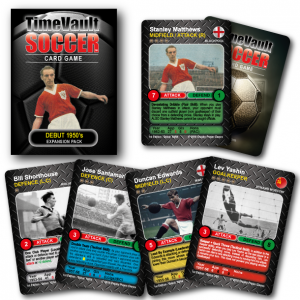 Capped 54 times by England and scoring 11 goals in total over a record 23 year career, at 42 years and 104 days old Stanley Matthews remains the oldest player to ever represent England. 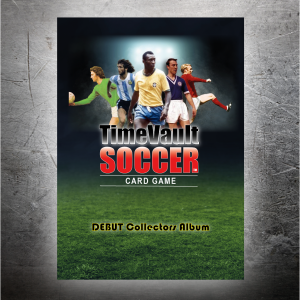 When he turned out for England in a 7 – 2 win over Scotland in 1955, Duncan Edwards was making his England Debut, when Matthews had made his, Edwards had not yet been born. The great Brian Clough said of Sir Stan “I grew up in an era when he was a god to those of us who aspired to play the game” whilst John Charles declared “he was the best crosser I’ve ever seen – and he had to contend with the old heavy ball”. 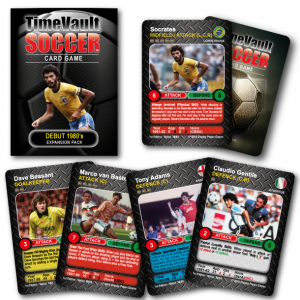 The Time Vault Soccer card game doff’s it’s cap to this Stoke, Blackpool and England Legend with a representation of the 1952-53 FA Cup winning season – The Matthews Final. Devastating Dribble (Flair Skill): When you play Stanley Matthews in attack your opponent must discard one outfield player (non goalkeeper) of their choice from a defending move. Stanley stays in play ALSO Stanley Matthews cannot be caught offside. Strategy Tip: A true game changer that challenges your opponent to rethink their own strategy. A Manager who does not have a plan to deal with the attacking threat of Matthews is a Manager likely to be torn asunder… by the first gentleman of soccer. 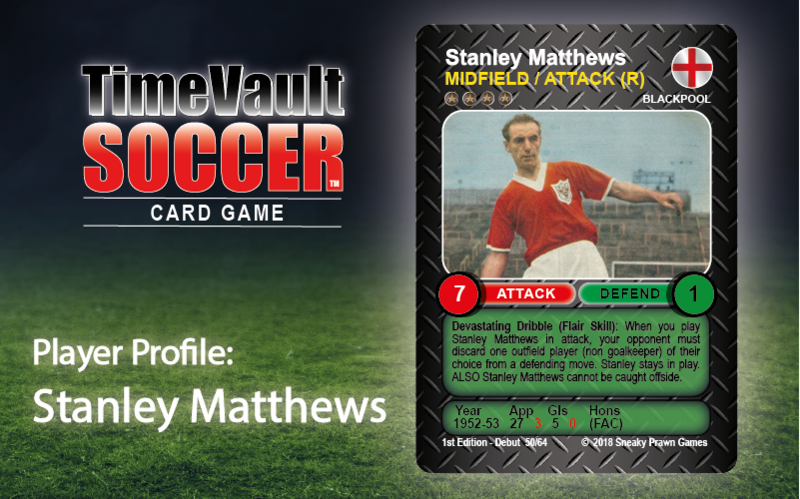 This entry was posted in TVS Player Profile and tagged 1950's, 1952-53, 4 Star, Attack Right, Blackpool, England, Midfield Right, Stanley Matthews.